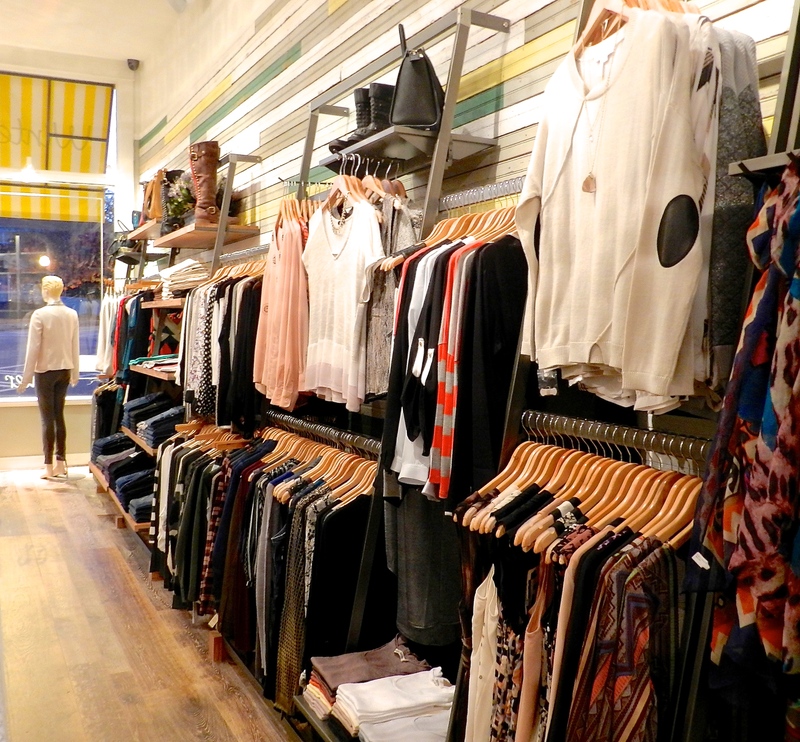 This is not about ANOTHER ladies’ boutique in the Virginia-Highland neighborhood. It is much more. 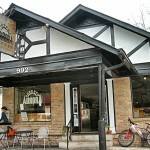 Winter Wren Hodges purchased a house just down the street from his latest project in the Morningside area back in 1996. He made it his home in 2011. Owning a retail store with his namesake has been a dream for almost two decades. 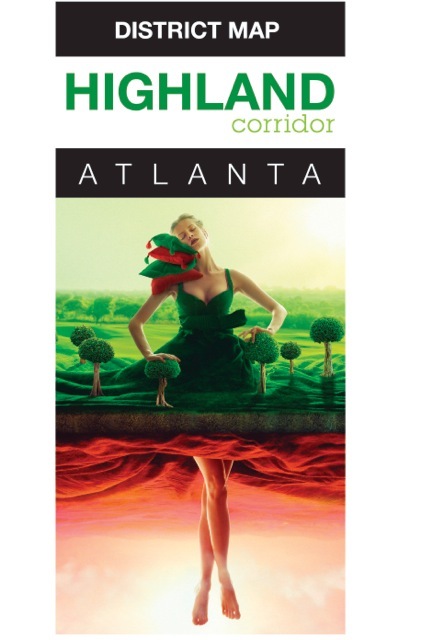 Atlanta is his largest market and Virginia-Highland is his favorite place to be. He introduced 310 Rosemont (named for his childhood address) in 2011. 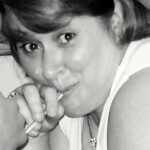 In early 2012, Hodges was diagnosed with MDS. After a later diagnosis of AML and a stem cell transplant, Hodges spent every possible moment planning a new concept that would be compatible with 310. Winter Wren, which opened this past month, has a well thought through selection of labels with location, customer and price point in mind. 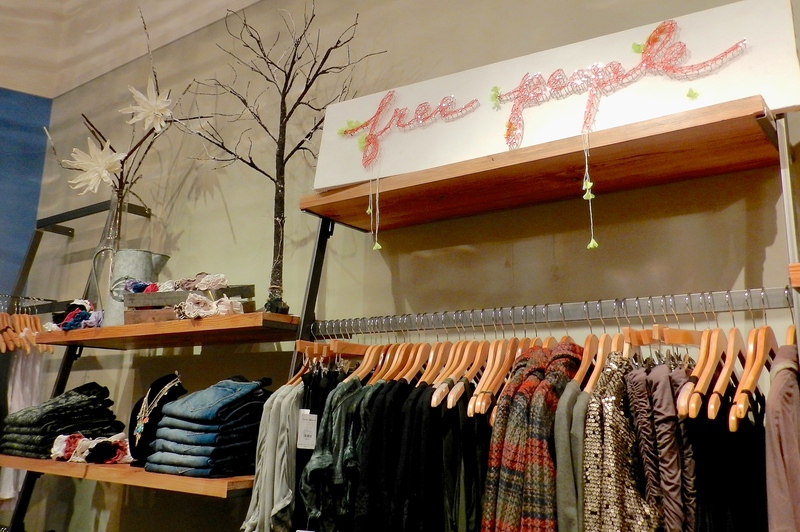 A Free People shop is a strong component of Winter Wren with shoes and accessories from designers like Michael Kors, Minnetonka, Rebecca Minkoff, Ugg, Hobo and Ty Jewelry. Other clothing lines include BB Dakota, Michael Stars, Ella Moss, Wildfox and 7 jeans. 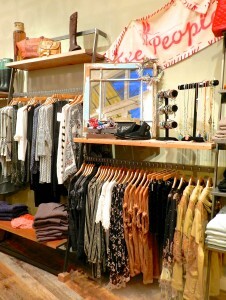 Although it is another boutique, Winter Wren is a great addition to the neighborhood of retail. 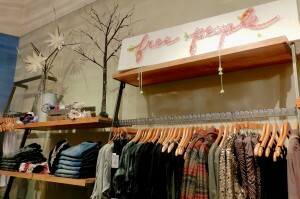 Light and airy, fresh and savvy, it offers alternative brands with pricing every customer, partner or husband will love. After his recent battle with cancer, Winter thought about slowing down. However, knowing his love of retail as well as his love for the area, he feels as though he is in fact slowing down. He knows this is where he is supposed to be. He actually bought a pair of boots in one of the local stores back in 1995. 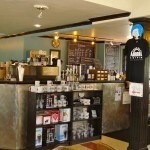 It was that experience which gave him the dream of one day opening a store and just being a part of such an awesome community. He counts it as one of his many blessings. It’s really not just another boutique. 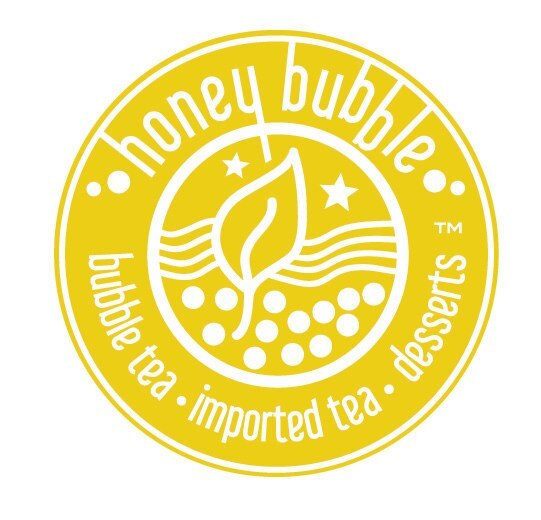 HoneyBubble – a bubble tea, fine tea and dessert emporium – has opened at 798 Ponce de Leon Avenue, next door to China Dragon. The shop is a collaboration between two Atlanta residents who wanted to make bubble tea and serve it in a sleek, relaxed environment. Bubble tea, also known as pearl milk tea, boba milk tea, or boba, is a Taiwanese tea-based drink invented in tea shops in Taichung, Taiwan during the 1980s.Most bubble tea recipes contain a tea base mixed with fruit or milk. Ice-blended versions are usually mixed with fruit or syrup, resulting in a slushy consistency. Most bubble teas come with small chewy tapioca balls, commonly called “pearls” or “boba.” There are many variants of the drinks, and many types are used and ingredients added. The most popular bubble drinks are bubble milk tea with tapioca and bubble milk green tea with tapioca. 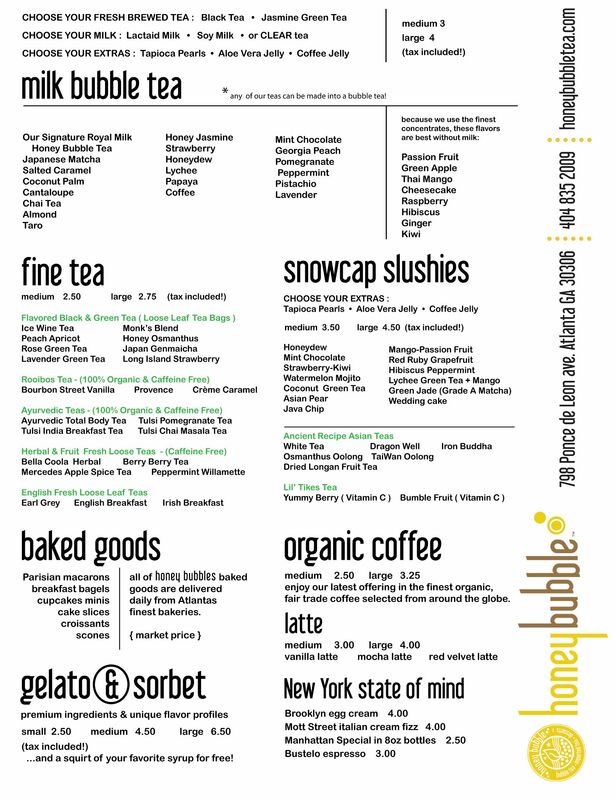 Each drink at HoneyBubble is tailored to customer taste. 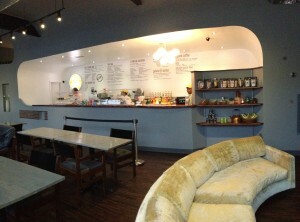 Whole milk, soy milk and Lactaid are options in creating your perfect bubble tea “cocktail.” No white sugar is used to sweeten HoneyBubble’s drinks – only pure honey and brown cane sugar. 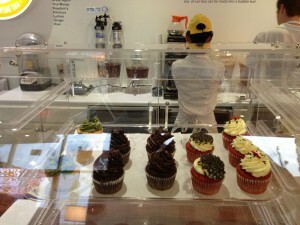 HoneyBubble’s focus is on mixology and beverage options, and they’ve chosen to let the dessert experts take care of the sweets. French-style macaroons, croissants and scones from Alon and cupcakes from the Atlanta Cupcake Factory can be purchased to complement your beverage. Frozen treats from Atlanta artisans Honeysuckle Gelato are also available. 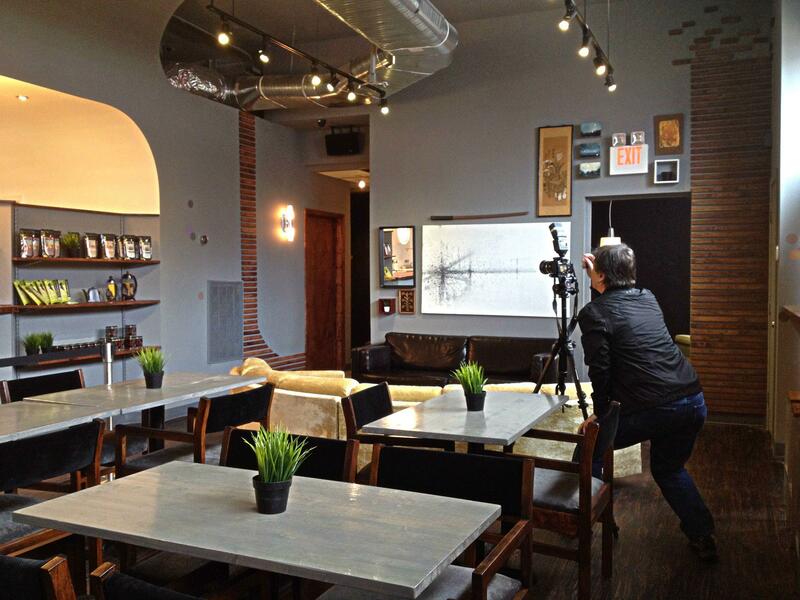 The shop’s sleek interior (see pictures below) was created by designer Doug Hines of HGTV’s Design Star series. All water used – including ice – is double-filtered for the best possible taste. 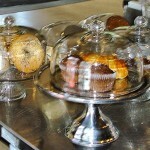 HoneyBubble’s teas are sourced from 21 different purveyors and only the best teas, coffees and desserts are served. All teas are made to order, not sitting in bins for hours or days. 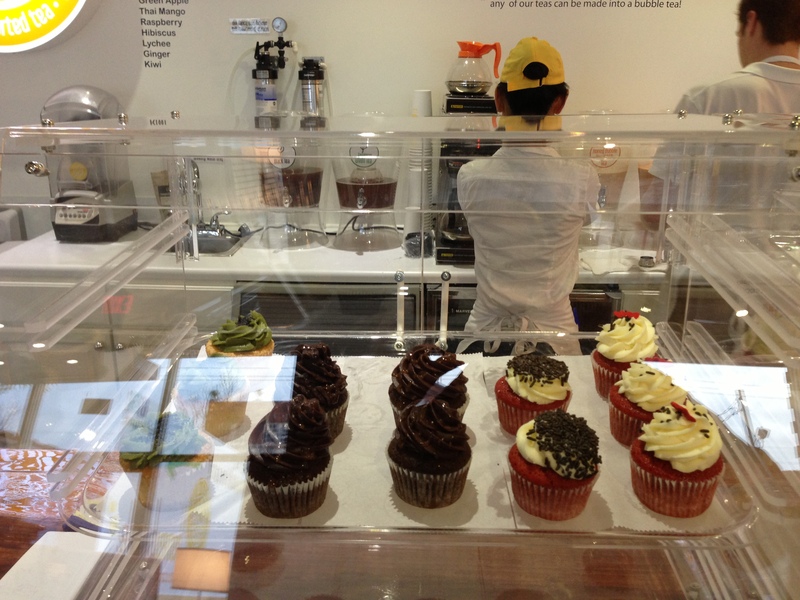 This takes a little more time, but you’ll taste the difference. 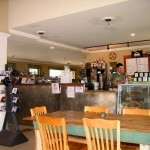 HoneyBubble makes extensive use of eco-friendly materials, fixtures and supplies. Free WiFi is available, as is a free conference room for private meetings. 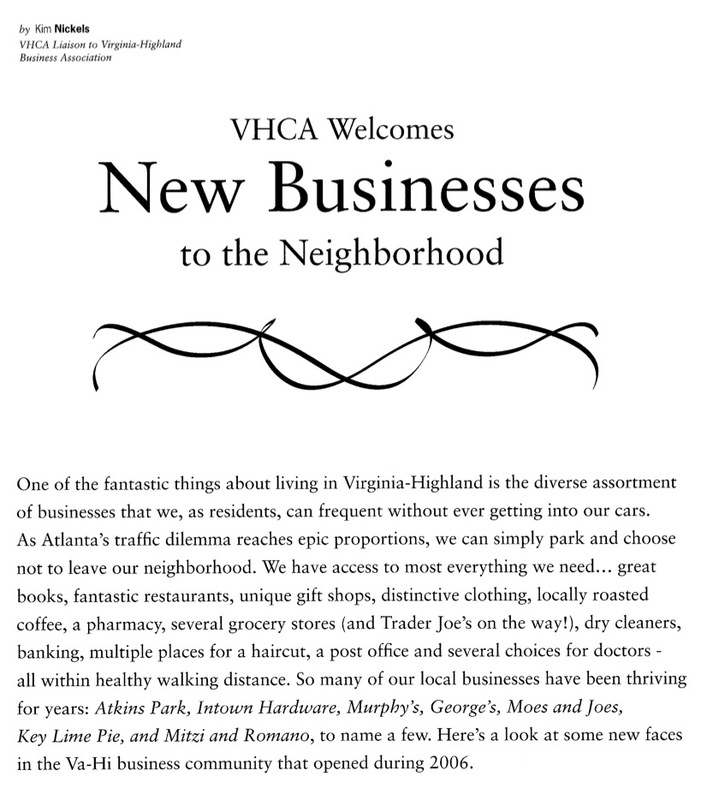 For members of the Nextdoor Virginia-Highland online community, a review of HoneyBubble by David Eckoff can be found on that site. 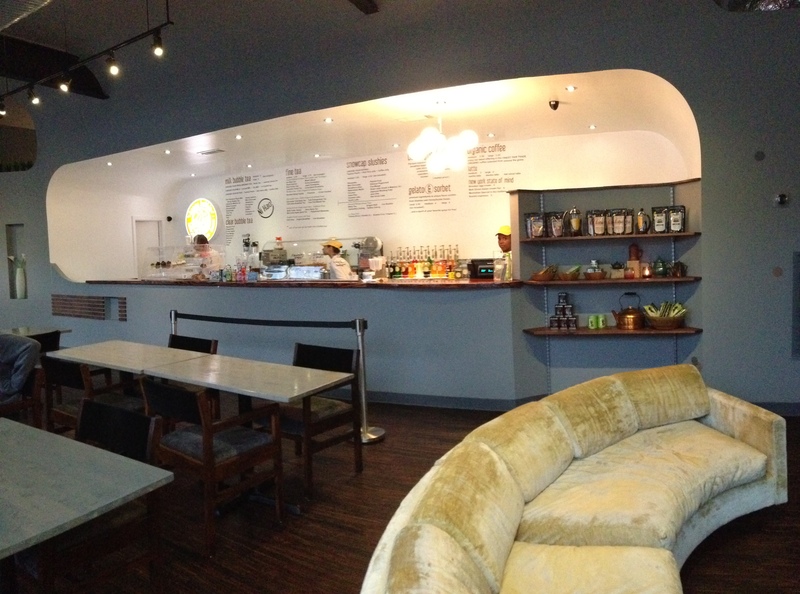 Make a point of stopping in soon to check out HoneyBubble Tea Shop! The weather has finally turned colder making it feel like it really is December and the season for celebrating the holidays with friends and family. 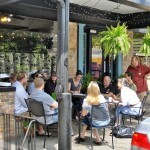 With everyone’s busy schedules it can be difficult to find a time when everyone can get together. And, let’s face it, while it is always wonderful to see everyone at holiday parties, the usual party fare can get a bit tiresome. If you have seen one cheese log, you’ve seen them all, right? So why not try something a bit different this year? 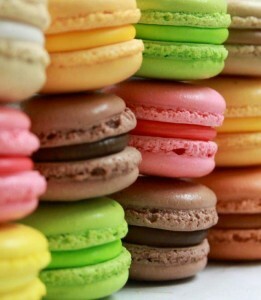 Perhaps an after-dinner party with desserts and warm drinks with everyone gathering around a fireplace? 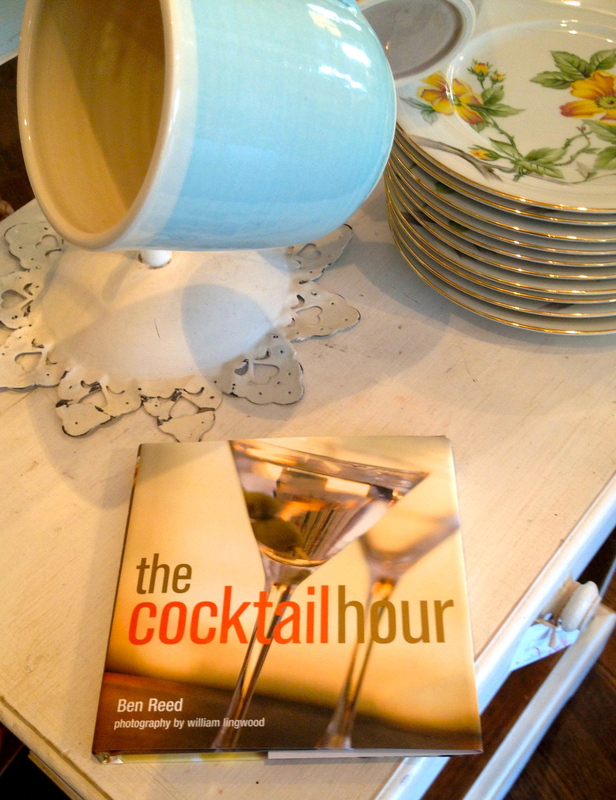 With this idea in mind, I popped into Urban Cottage to peruse their collection of cookbooks and to find some festive serving pieces. 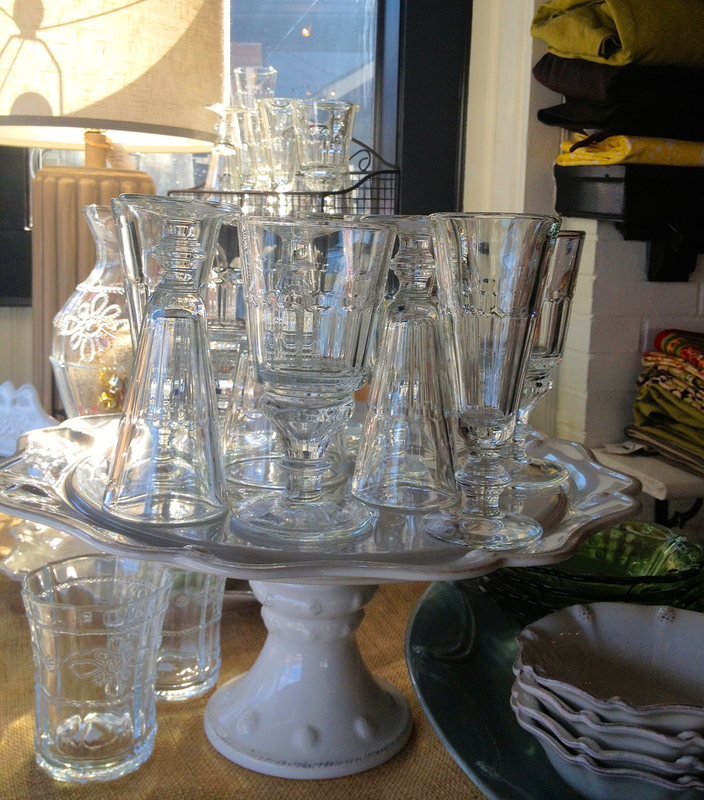 After a wonderful stroll through their treasure trove of goodies which are an eclectic mix of vintage and well-placed new items, I found some sturdy goblets perfect for cold or hot drinks as well as napkin rings, and pretty linens. A few doors down at Festivity, I picked up a cheese tray and knives to complete the ensemble. Now what to serve? 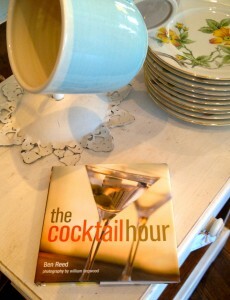 Normally, we would start the evening with cocktails; a favorite being gin and tonic. So in an “Ah-Ha” moment, we decided on “Gin Toddies” a sophisticated spin on the seasonal Hot Toddy to go along with artisanal cheeses (from Alon’s Bakery) and spreads (from Bella Cucina Porta Via) and some homemade pizzelles, torrones and amaretti. 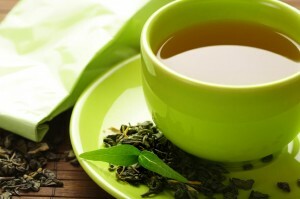 Put a teaspoon of sugar in a heat proof glass or mug and add boiling water. Stir briefly to dissolve sugar and then add gin and lemon juice. 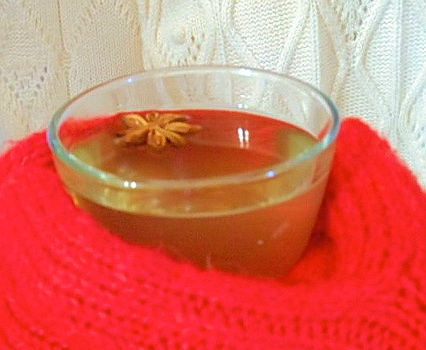 Stir to combine and garnish drinks with your choice of cinnamon sticks, cloves, cardamom pods, star anise, or lemon slices. 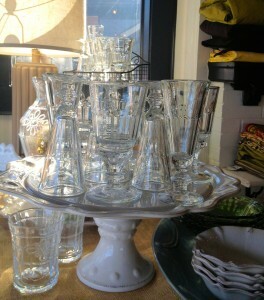 It is not too late to get your party supplies or pick up the ideal hostess gift at one of our wonderful neighborhood shops and remember to eat, drink and shop locally on Thursday, December 20th at “Holidays in Virginia-Highland” with special promotions at participating shops and restaurants. 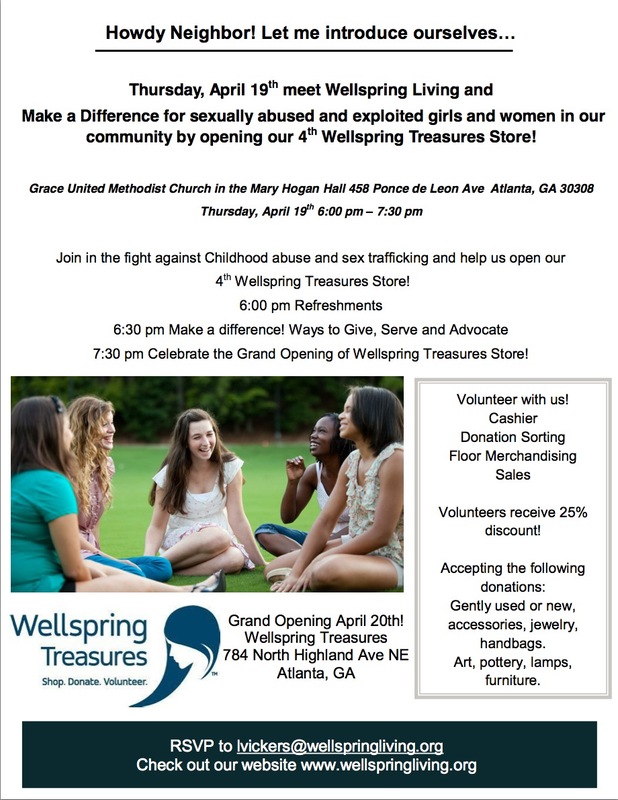 For more information about the event, contact Jessica at info@urbancottageatlanta.com. One of Virginia-Highland’s local business owners had the great honor of being selected as part of the team that decorated the White House for Christmas this year. Laura Iarocci, owner of Faith Flowers on N. Virginia Avenue, was part of a team of 75 volunteers from all over the United Statues who arrived in the nation’s capital on Thanksgiving Day to begin their daunting task. 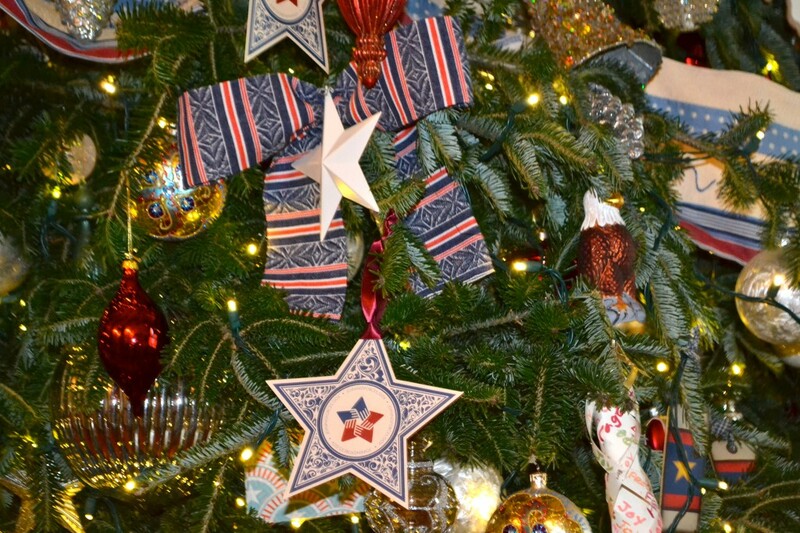 The group spent the first two days sorting through and repacking ornaments and decorations from prior White House Christmases (many of the decorations are recycled and reused each year). The volunteers arrived on Sunday with truckloads of boxes and spent the next three days decorating every room in the White House. Mrs. Obama hosted a reception at the end to thank all the volunteers who participated. 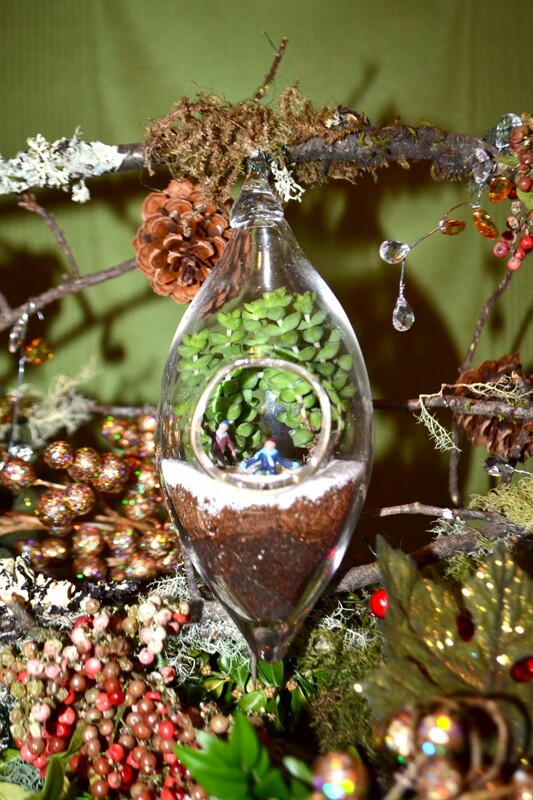 Faith Flowers will hold an open studio day on Saturday December 15 featuring two local artists working in the studio. 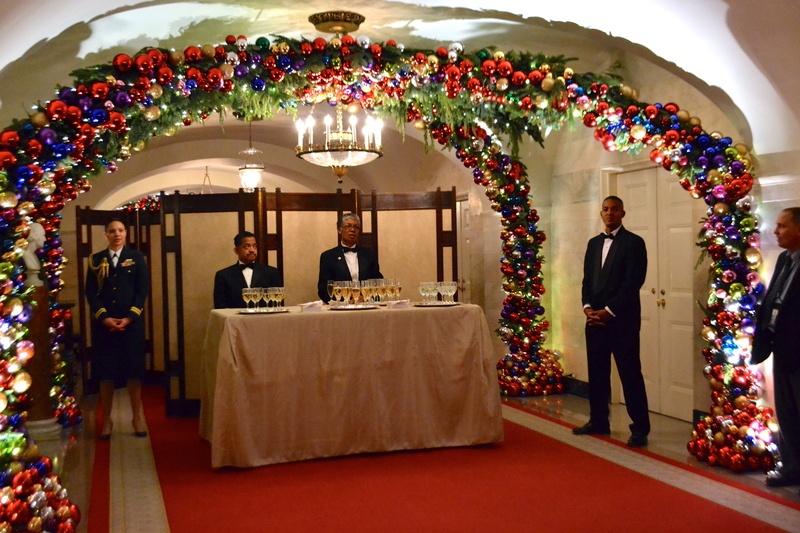 Photos from Holiday 2012 at the White House will be on display throughout the day. Scroll down to view images from Iarocci’s trip. 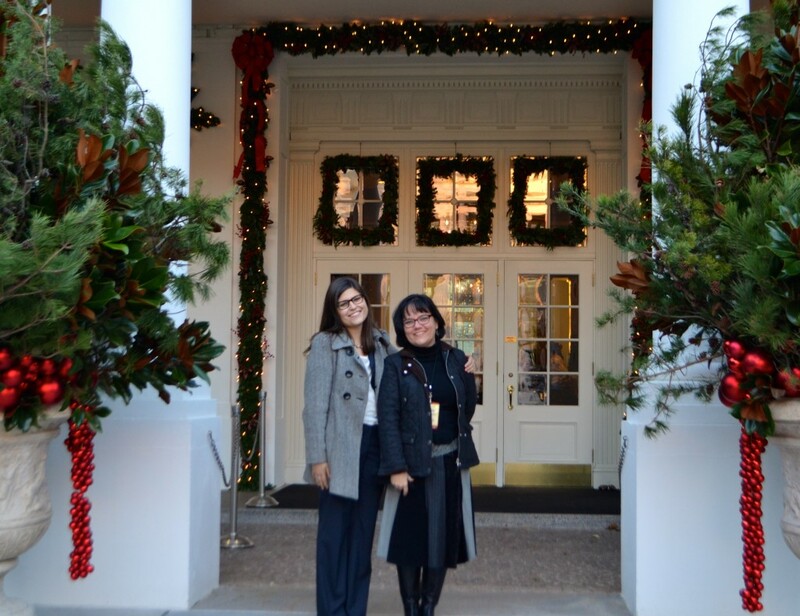 Laura (right) and her daughter Allison at the White House visitor’s entrance. 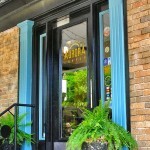 Laura created the wreaths on the windows. Bauble Archway in the Lower Cross Hall connecting the East Room. Over 6000 ornaments were strung on these arches, all recycled from previous years. 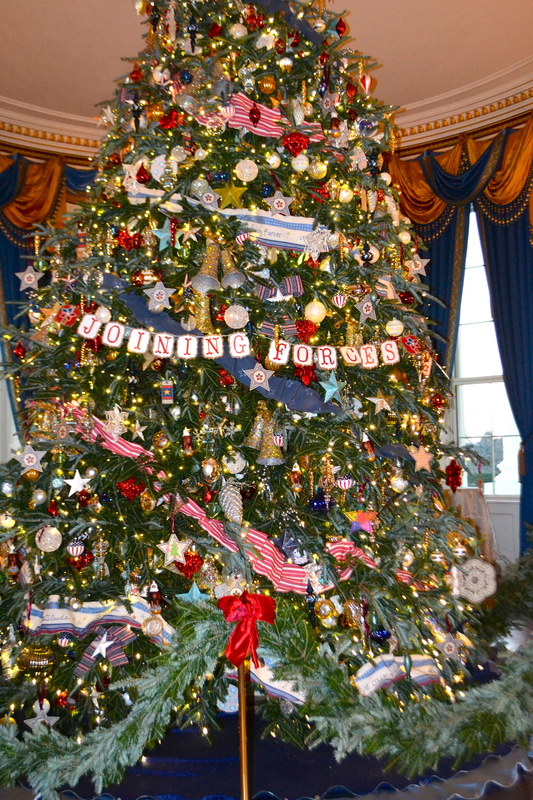 The Armed Forces tree in the Blue Room. 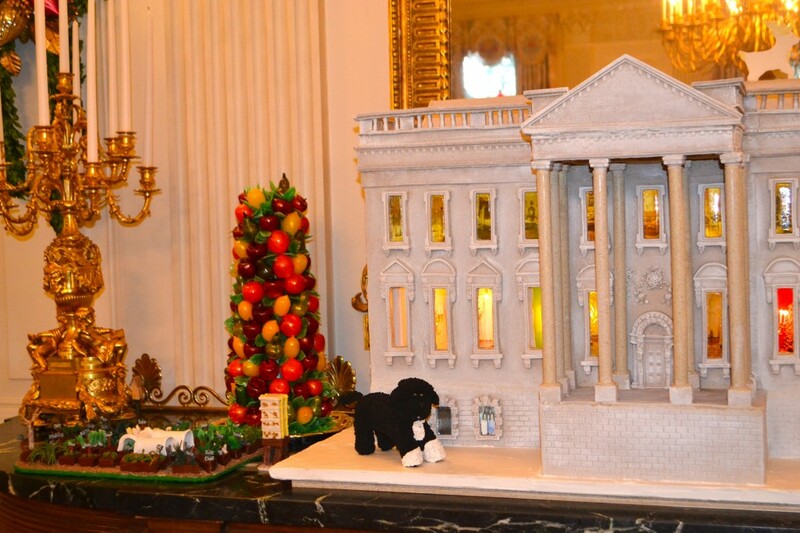 The White House gingerbread house with pictures of the First Family and staff affixed to sugar glass windows. And yes, that's First Dog “Bo” front and center. 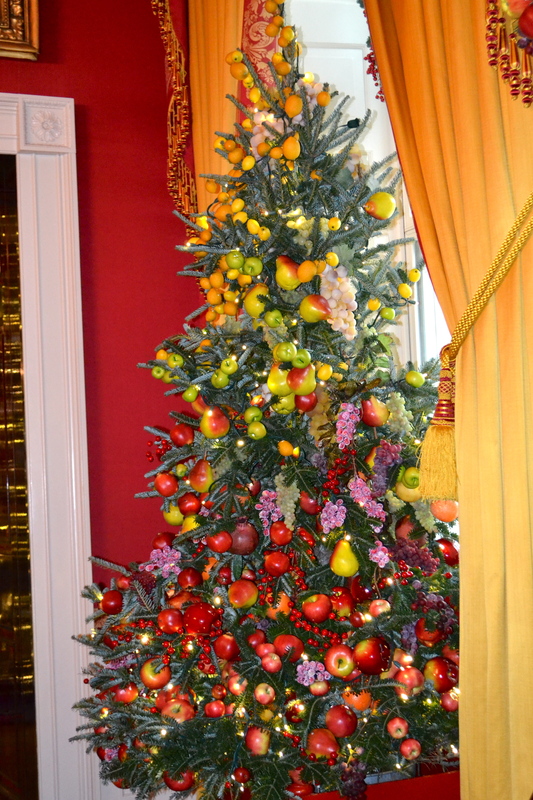 The Red Room Tree and mantel filled with fruit, all recycled from prior Christmases. 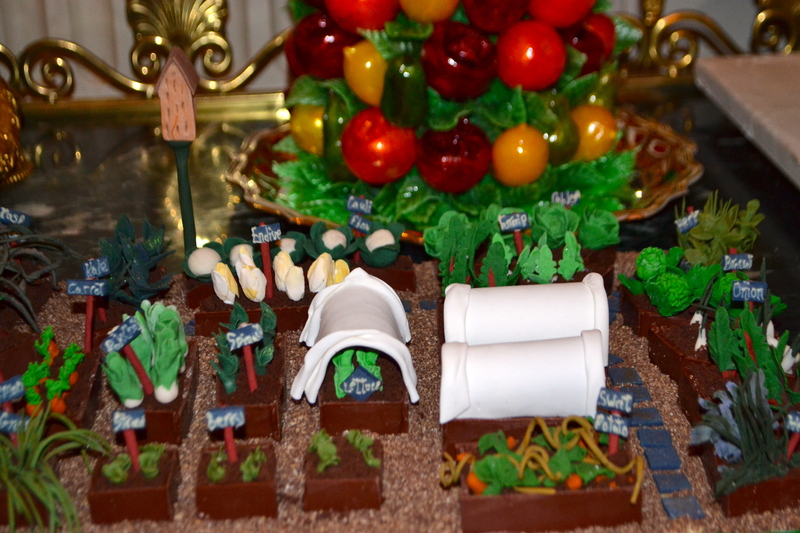 Michelle Obama’s vegetable garden recreated next to the gingerbread house. Many of the ornaments were created by military families. 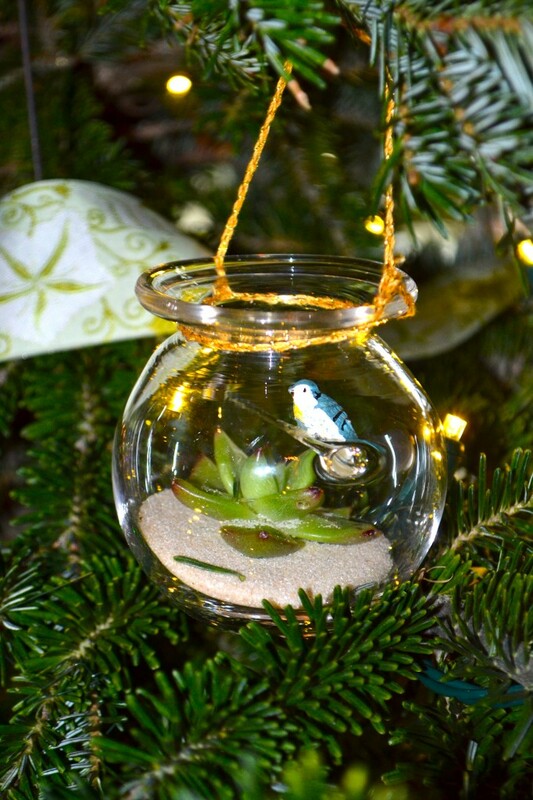 Hanging terrariums on the Green Room tree. Check out similar ones at the Faith Flowers studio. 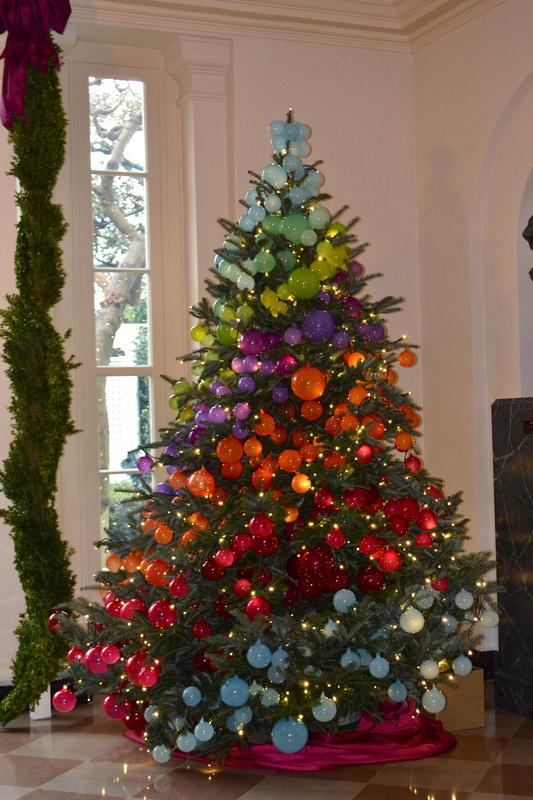 Laura’s favorite tree with hand blown glass ornaments in color bands around the tree. 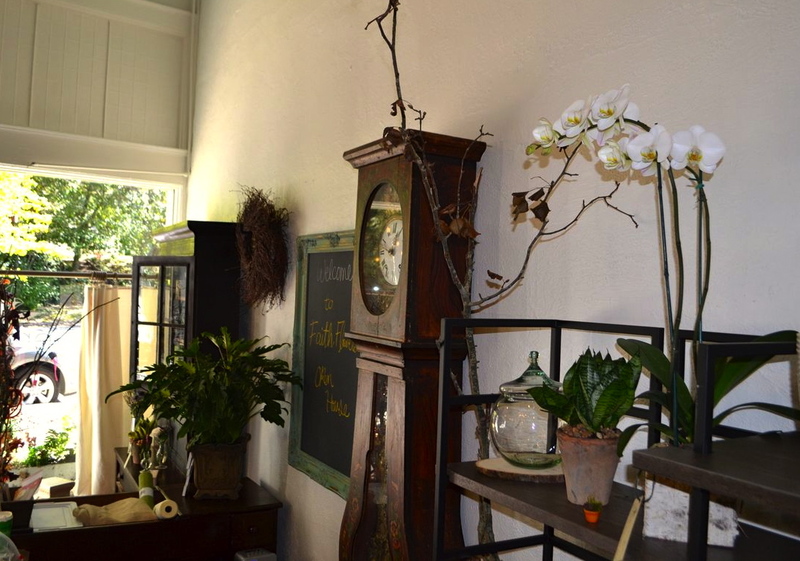 Faith Flowers, a European-style flower studio and school, has opened in the retail space at the corner of Virginia Avenue and Rosedale Drive. 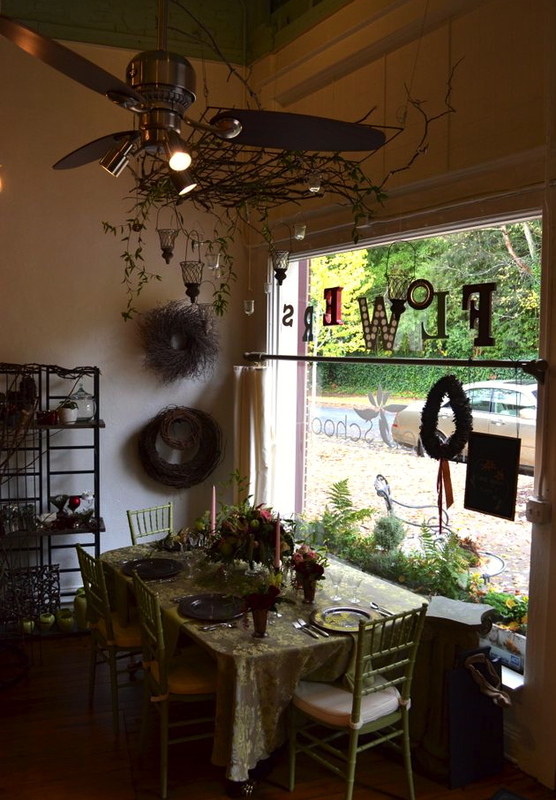 Faith Flowers is an “open flower studio” where visitors can see floral designers at work in a wonderfully vintage setting. 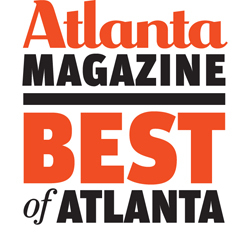 Located in a residential part of Virginia-Highland, Faith Flowers takes visitors back to an older Atlanta, when people walked to their neighborhood store for groceries. 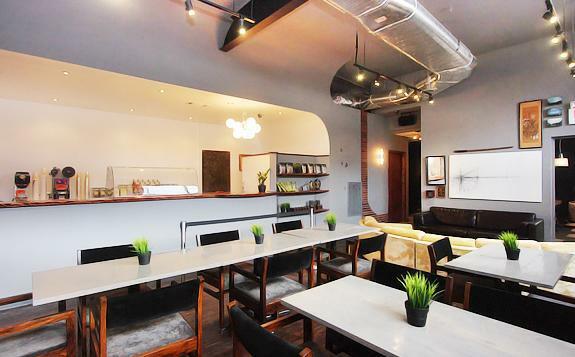 The space has a natural feel to it – wood floors and a loft ceiling (the latter feature being quite important before the advent of air conditioning). 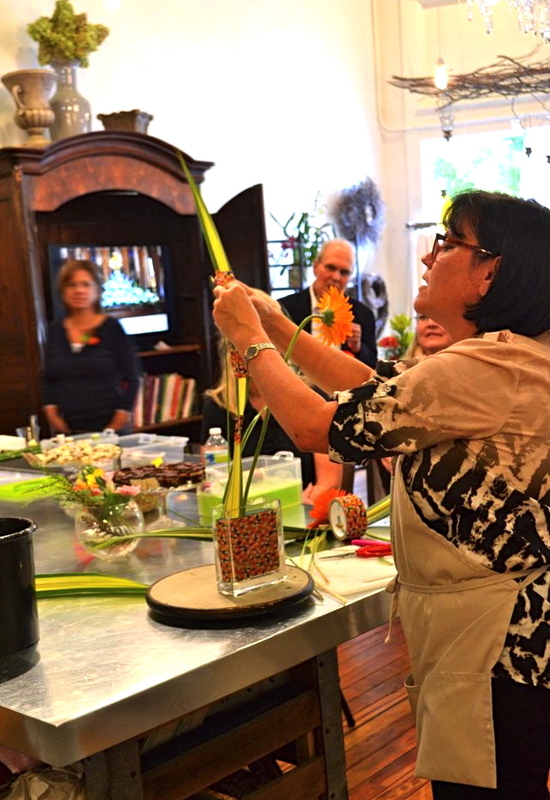 Laura Iarocci, an internationally known flower arranger and teacher, owns Faith Flowers. 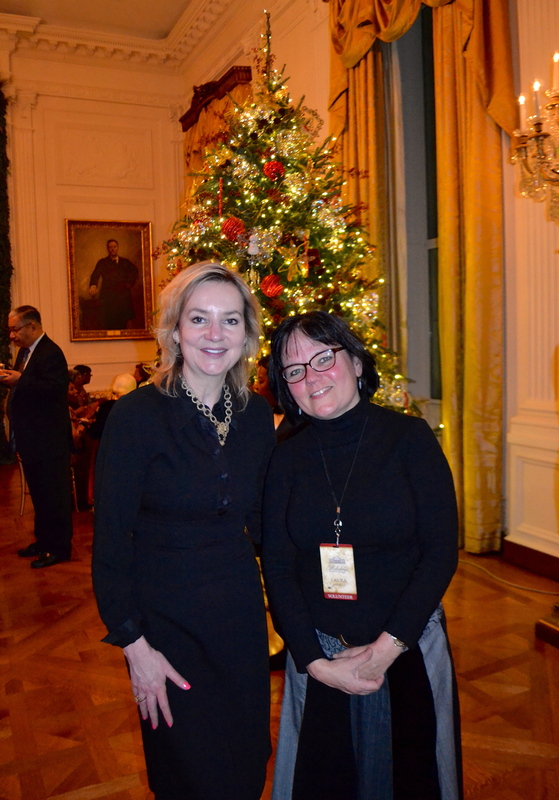 Her most recent work includes decoration of the White House for Christmas 2012 (more on that in a future Voice article). 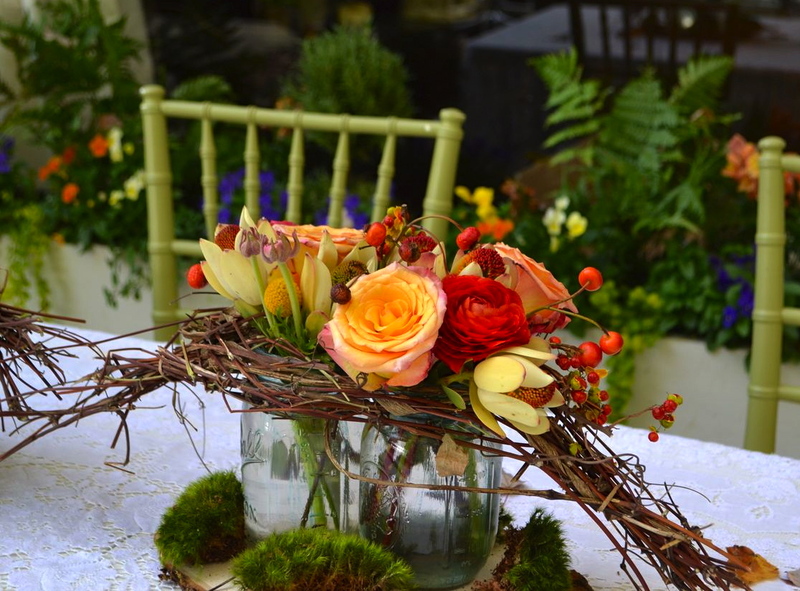 Faith Flowers creates arrangements for weddings, events or any occasion, their flowers having graced the ballrooms of premier venues all over Atlanta. Inside the studio, Faith Flowers sells European hand tied bouquets and unique, natural arrangements ready to take home. Custom orders can be filled as well. 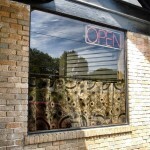 The studio also offers unique gift items, including potted plants, succulents and floral related gift items. Flower arrangers can purchase an array of products and tools of the trade. 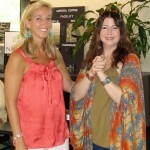 Christina Perry Design has recently begun displaying its floral-inspired jewelry pieces. 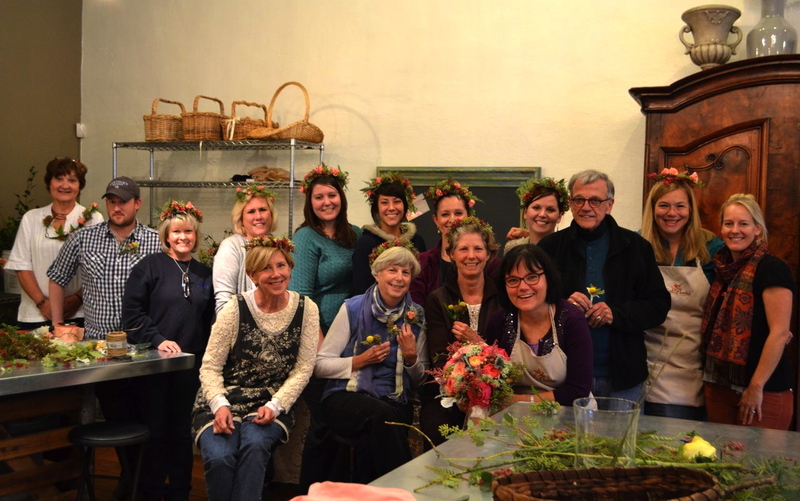 For those who want to go beyond just a floral purchase, the Faith Flowers school offers classes for beginners and experts alike – anyone who loves flowers and gardening will enjoy the classes. 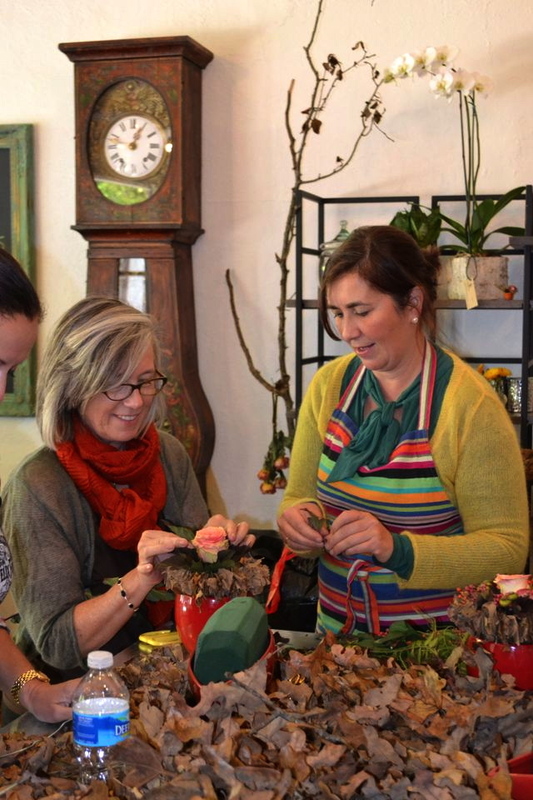 Classes include “Flowers 101,” “Flowers from Your Garden,” “Weddings, Grocery Store Flowers” and more. There are even classes for children. 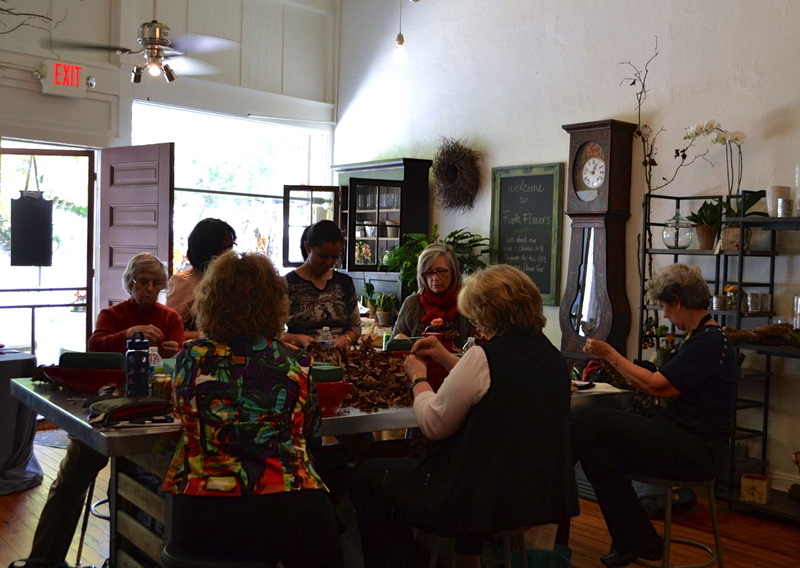 Special classes for groups of friends, birthday parties, or corporate team building are available and guest designers are invited to teach regularly. 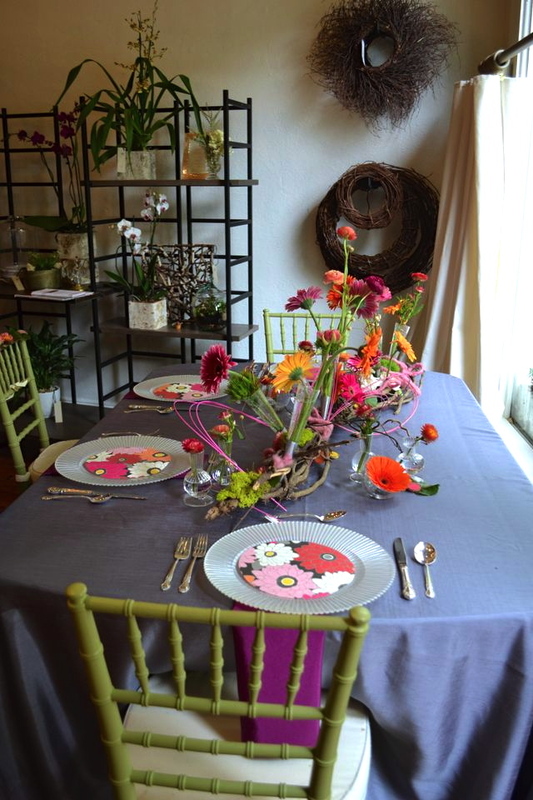 Iarocci is eager to get involved in the neighborhood and has even donated flower arrangements for some of the homes on this year’s Virginia-Highland Tour of Homes. 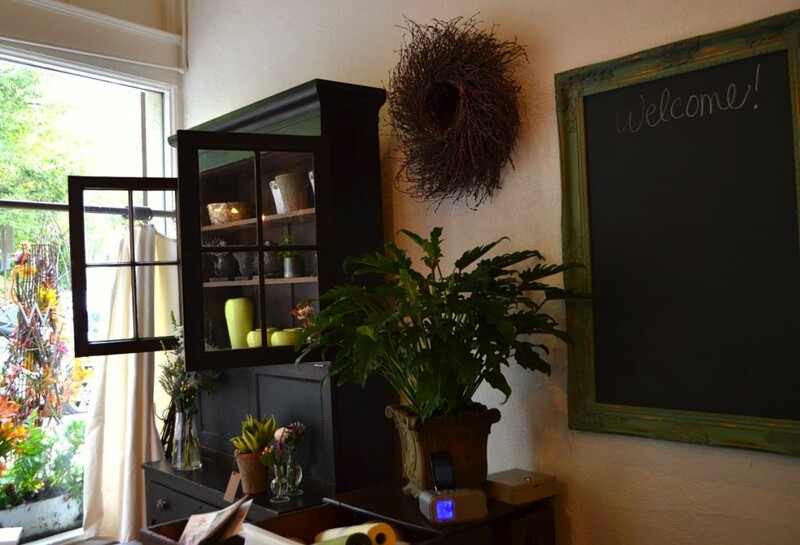 She invites VaHi residents to stop by the shop to explore how the flower magic happens, or just check out their inspired window displays on your walks around the neighborhood. 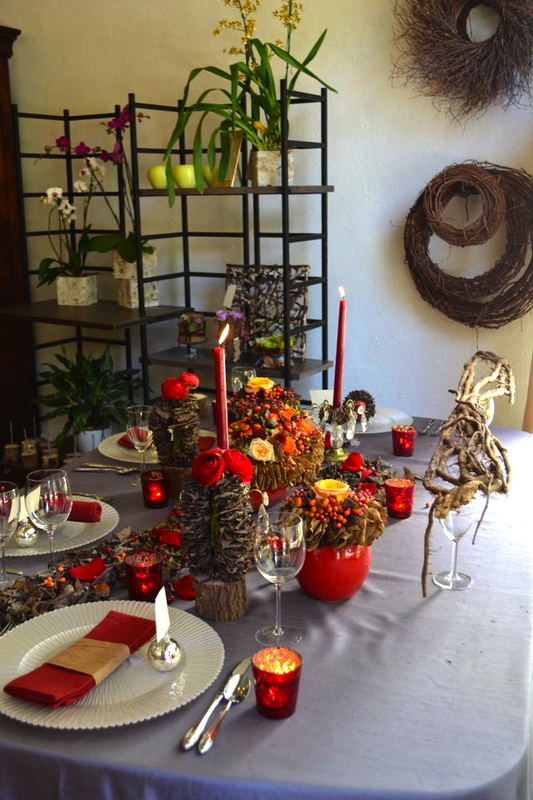 Scroll down to see a few photos from Faith Flowers! European designs on the sidewalk outside the studio. Guest designer Gudrun Cotteniere with Flower Magazine editor Margot Shaw. 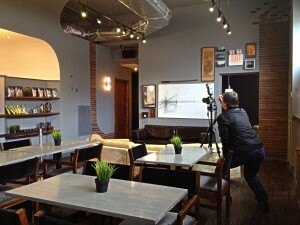 Owner Laura Iarocci teaches a class. Students in guest designer Holly Chapple's class wear the flower girl crowns they created. VaHi resident and Ten Thousand Villages employee, Juliet White, has volunteered to do the leg work to get the businesses in VaHi organized again. 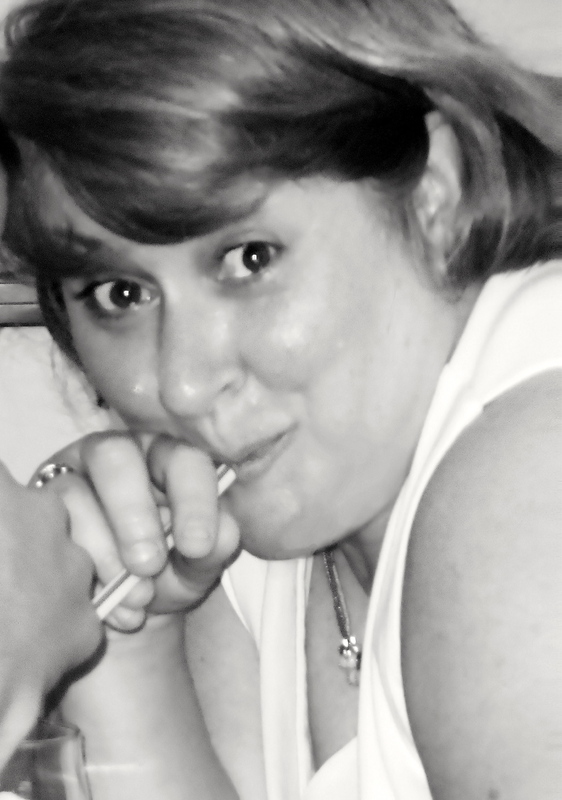 If you would like to help her with this project or of you are a business and would like to be united with the other 100 + businesses here, contact Juliet at piloteminuit@yahoo.com Juliet stresses she will not be able to lead the group once it gets off the ground – the business community will have to provide leadership thereafter.